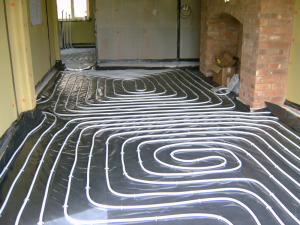 Underfloor Heating provides a highly cost effective and discrete heating solution for many areas of the home, in particular conservatories, kitchens, bathrooms and extensions. A well designed system will provide good controllability, economy, and many years of maintenance free service. With all the heat being generated at ground level, occupants benefit from the heat rising evenly throughout the desired space without the hot spots and heat layers associated with traditional single point heat systems such as radiators. The feeling of warmth from floor surfaces which we expect to be cold provides a luxurious touch, and with the heat source being hidden, with the exception of our discrete programmer, is extremely practical as well as stylish - no wall space lost to ugly radiators.